Thrill rides are not just roller coasters - there are also drop towers, Frisbees, simulators, slides, pendulums, sling shots and more. Every year, it seems that new rides come out that attempt to better their rivals in terms of height, speed, airtime, inversions and any number of factors that will give thrill seekers that extra hit of adrenaline they so badly crave. 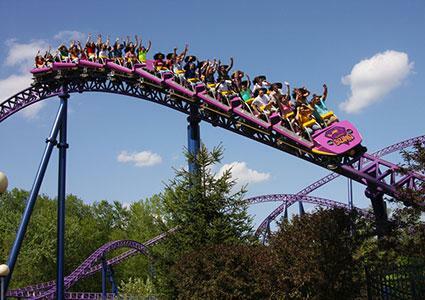 Introduced as the Superman Ride of Steel roller coaster when it first opened in 2000, the Bizarro roller coaster at Six Flags Great Adventure is still regarded as one of the two best roller coasters in the world. Why? Just imagine the state of your nerves as you drop 120 feet, 77 miles per hour (mph), at a 70 degree angle straight into the pitch black of a tunnel. If you are lucky enough to get a seat at the front, you are in for a thrill. As Theme Park Insider says, "The sensation of flight is unbeatable." The Coaster Critic and Theme Park Insider rate it ten out of ten - a rare feat, indeed. As officially the fastest drop tower in the world at 85 mph and the second tallest at 400 feet, you would think customers would do nothing but rave about the "VERY long drop" on Six Flags Magic Mountain's Lex Luthor Drop of Doom. They do talk about it - and in reverent tones - but the drop is not what sets this ride apart as the most thrilling ride of its kind. What really sets this ride apart is the fact that it shares the Escape from Krypton Tower with the Superman Rollercoaster. As Brady Macdonald states in the LA Times, "When this rockets past at close to 100 mph it feels like an earthquake in a skyscraper - only you're strapped to the outside of the building." It is after this has passed, and the steel tower has stopped swaying from side to side, that you will hurtle the 400 feet to the bottom. Voted the best water ride of 2013 Holiday World's Wildebeest is not your typical get-your-top-slightly-wet-if-you-sit-at-the-front water ride. Moving at speeds as fast as 36 feet per second this takes you through seven drops, the highest being 38 feet, two long dark tunnels and a series of curved bends - or helixes as they call them in the industry. These statistics qualify Wildebeest as the water ride version of a roller coaster. "I expected little," said one reviewer, "but got one of the craziest, most unique water ride experiences I've ever had. At 1/3 mile long Wildebeest is a real thrill epic." 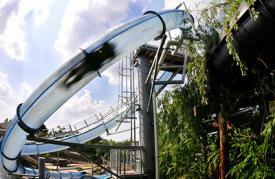 The Scorpions Tail at Noah Ark's Water Park is a "nearly vertical" water slide. With a descent of nearly 70 degrees, you will suddenly find yourself hurtling down when a trapdoor on the top platform flings open. 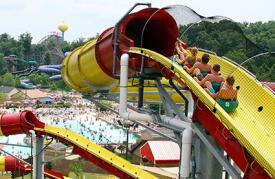 At 30 mph you are moving more than fast enough to experience America's first water slide loop. As one reviewer states it is "a water tunnel of terror! I told myself that I would not be able to live with myself unless I faced the challenge of the ride. Boy am I glad I did!" Pacsafe.com names it as one of the five best water slides in the world. If there is one website that loves The Amazing Adventures of Spider-Man at Universal Studios Islands of Adventure, it's Theme Park Insider. Over 55% of their readers voted it the best motion-base ride and one reviewer stated "This is easily one of the greatest, if not the greatest, ride ever made. 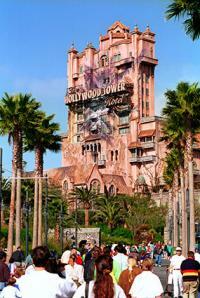 The theming is excellent, the ride itself is fantastic, and the 3-D and sound is high-tech and flawless." What makes this ride thrilling is that it places you in Spider-Man's world as he attempts to stop a group of super-villains, including Dr. Octopus and the Hobgoblin, from taking over the city. From his perspective you will soar above the city, feel your way through fog, suffer intense heat, and fall 400 feet to what could be your death - "a unique, yet surprisingly intense theme park experience." In the old days, when you queued up for a thrill ride you would have nothing but your friends and the screams of the riders to entertain you. Now almost just as big part of the thrill is taking in the atmosphere of the elaborate themed buildings these rides are so often housed in. The building itself can have you shaking in terror before you even know the ride has a near vertical drop, and that is the case with Hollywood Studios' Twilight Tower of Terror. When you enter this ride, you are lead into an old hotel lobby where a bellhop asks you to wait while he finds you a room. As soon as he is gone, the lights go off, lightning strikes and, in the words of Rod Sterling, you feel like you are "about to enter the Twilight Zone." When the bellhop returns you will go up and down in a lift and up and down again before a random hurtle down a full 13 stories to whatever awaits you at the bottom. 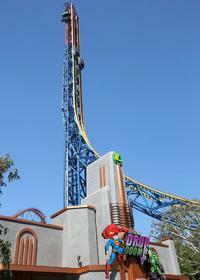 As Theme Park Insider states, "It most likely clinches the spot for best drop tower ride ever created." Before you make a hasty decision to ride the Sling Shot vertical thrill ride in Myrtle Beach, you should really listen to those who been there, done it and lived to tell the tale. "I'm not going to lie," said one rider, "waiting in line made me feel like my knees were going to give out. Sitting in that chair about to take off will just about make you have a heart attack." Another simply stated, "let me tell you, when the Sling Shot is first released it will blow your mind!" None of it is hype. As befitting a ride that only takes two passengers at a time and costs a whopping $25 per go, Sling Shot not only slings you up 300 feet into the air - as the website states as roughly as high as the Eiffel Tower - but does so at 100 mph. If you and your partner get it right and dare to do so, you can spin yourselves thorough 360 degree turns on the way up. 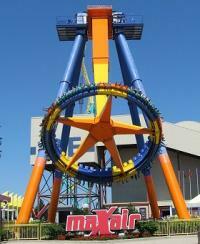 At the beginning of 2013 Six Flags Over Texas went all out and opened the tallest sky screamer in the world. Adding to the ride's height is its speed. It starts slowly, a bit like an old fashioned carousel, as it winds up and up. As soon as you hit the top however, your speed will increase to 30 mph. When you are sitting on a swing, 400 feet above the ground, 30 mph feels very, very fast. Said one Trip Advisor reviewer, "It was SOOOO worth it. The ride was breath taking and thrilling, it felt like a dream. I was mesmerized by how beautiful everything looked and paralyzed by the excitement and fear so high up over the park it really felt like an out of body experience." Big Shot is no ordinary thrill ride. "If this ride simply sat on the ground it would be scary," said one Yelp reviewer, "but add to that the fact that you're a fifth of a mile up and it's terrifying." By the way, a fifth of a mile is 1,000 feet. 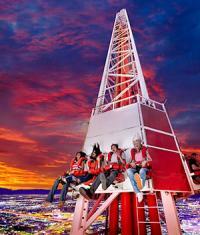 That is 1,000 feet on top of the Stratosphere Hotel above the valley of Las Vegas, which would make for a great view and a wonderful photograph opportunity if this ride gave you time to even breathe - which it does not. Strapped into a floorless gondola on the roof of the 900 foot high Stratosphere hotel, you will shoot up and down a 160 foot tower at a speed of 45 mph. The few second pause at the top is just long enough for you to realize just how far you have to fall. maXair is a thrilling pendulum. While the majority of the most thrilling rides are free falls and roller coasters, some other types of rides can be just as exciting. On the Theme Park Review Forum, MaXair at Cedar Point is frequently mentioned as a fan favorite. MaXair is a giant Frisbee ride that swings riders up and down at 70 mph and as high as 140 feet, while also spinning them around at the rate of 12 times per minute. Rating MaXair as extremely intense, Experience the Point states that the ride "could easily be called a 'spin-n'-puke' ride, maybe even labeled 'insane'." When you are planning your next theme park getaway, remember that you only live once. If your idea of fun involves the adrenaline pumping excitement of thrill rides, there are plenty of great choices for you to try! The above rides are some of the fastest, scariest and exhilarating rides in America.